When Martha was asleep, he rose. The mutton-fat light still burned, though he had shielded its glow from the window. He stood, letting his mind become like a landscape into which strange thoughts could wander. He felt the frost gathering outside the house, and the silence, and turned away to close his mind again. The light stood on an old chest of drawers. He opened one of the drawers at random and looked in. It contained family trinkets, a broken clock, some pencil stubs, an ink bottle empty of ink. With a feeling of wrongdoing, he pocketed the two longest bits of pencil and opened the neighborhood drawer. Two photograph albums of an old-fashioned kind lay there. On top of them was the framed picture of a child. The child was a boy of about six, a cheerful boy whose smile showed a gap in his teeth. He was holding a model railway engine and wore long tartan trousers. The print had faded somewhat. Probably it was a boyhood photograph of the man now stacked carelessly out in the sheep shed. Death is an integral part of human life. From embryo to newborn to adolescent to adult to the old-timer sighing out a death rattle, there is a natural progression in human societies as we age. For many, the fear of the inevitable death is mitigated by the knowledge that their legacy will continue with the children they have engendered and raised to carry on family traditions. For others, there is no consolation in death, only the forced acceptance that from birth, one is in a constant state of dying. Old age in particular contains its mixture of memory and grim acceptance: nostalgia for things now past, with few certainties besides death remaining for them to experience. But what if the greying age did not bring the hope of future generations to continue the cycle? What if this were it, that human life would become extinct when your generation passed? How would you react in such a situation? Would there be acceptance or denial? These questions were raised in several novels in the 1950s and 1960s as humans came perhaps the closest to wiping out human civilization - and the majority of all lifeforms - that we have ever seen. This period saw the release of novels such as Nevil Shute's 1957 novel, On the Beach, that posited the end of all human life as deadly radioactive fallout slowly moves toward the last southern outposts of humanity, as well as Walter M. Miller, Jr.'s 1959 classic, A Canticle for Leibowitz, that deals with the wiping out of human civilization due to nuclear war and its rebuilding. Man had gone, and the great interlocking world of living species had already knitted over the space he once occupied. Moving without any clear sense of direction, they had to spend another two nights on islands in the lake; but since the weather continued mild and the food plentiful, they raised very little complaint, beyond the unspoken one that beneath their rags and wrinkles they regarded themselves still as modern man, and modern man was entitled to something better than wandering through a Pleistocene wilderness. As Greybeard and his wife Martha move down the Thames River from the ruins of Oxford in an attempt to reach the sea, they encounter not just the empty reminders of what was lost, but oddly enough, signs that perhaps there are still fertile humans. Yet this discovery does not enliven them with hope. No, rather it makes no difference to Greybeard's generation, other than these half-feral upstarts are a disturbance to them and a threat to the quiet dissolution that so many of them seek. This realization is what makes the novel almost lyrical. More so than its quiet, understated metaphors for decline, decay, and dissolution, Greybeard contains a poetic power in its grim resolution to remember what is passing and celebrating that rather than any nebulous hope that might be born with a new generation that might succeed where they have failed. This lends the novel a sense of gravitas that otherwise would be lacking. Greybeard is not a novel to be read for its plot; there really is little to the story other than Greybeard's reflections on the changing scenery and how those changes were wrought. There is little overt conflict, unless one counts that inevitable conflict with that unbeaten champion of Death. 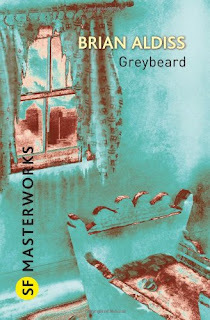 Some readers might find this 239 page novel to be dull for these absences, but for those who are willing to consider the themes, especially that of aging and the reluctant acceptance of one's impending doom, Greybeard might prove to be one of the more quiet, yet powerful, masterpieces of post-apocalyptic literature produced during the past half-century. But I have changed quite a bit since then and I decided to find a copy to read again, and you know what? I loved it! In fact I'd go so far as to say its probably the best Aldiss novel I've read!! Welcome to the Science Fiction & Fantasy Masterworks Review, a group blog dedicated to reading and reviewing Gollancz's series of genre classics in its entirety.